British military advice was given to India ahead of the 1984 deadly attack on a Sikh temple but it had only "limited impact", MPs have been told. Mr Hague said UK assistance was "purely advisory" and given months beforehand. The inquiry was launched last month after declassified documents were said to suggest Margaret Thatcher's government was involved in planning the raid, called Operation Blue Star. Official figures put the death toll at 575, but Mr Hague said other reports suggested "as many as 3,000 people were killed including pilgrims caught in the crossfire". "This loss of life was an utter tragedy," he said. "Understandably members of the Sikh community around the world still feel the pain and suffering caused by these events." 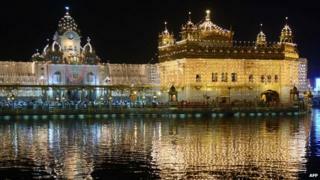 In 2007 a former Indian intelligence officer, B Raman, claimed agents from the UK's MI5 had visited the Golden Temple four months before the raid. The UK government review appears to corroborate the claim that a British adviser was sent. In India, Operation Blue Star has always been seen as a military disaster, which led to the loss of hundreds of lives - including those of civilians - and to the eventual assassination of the then Indian Prime Minister Indira Gandhi. Delivering his statement, Mr Hague set out the UK's involvement in planning for the raid. The adviser suggested using an element of surprise, as well as helicopters, to try to keep casualty numbers low - features which were not part of the final operation, Mr Hague said. No equipment or training were offered, Mr Hague said, and the Indian plan "changed significantly" in the following three months, to cope with a considerably larger dissident force and extensive fortifications within the temple complex. Prime Minister David Cameron said: "I hope the manner in which we have investigated these dreadful events will provide some reassurance to the Sikh community, here in Britain and elsewhere." He added: "A single UK military officer provided some advice. But critically, this advice was not followed, and it was a one-off." "If some things went around months earlier or weeks earlier with other agencies, intelligence agencies, I am not aware of them," he told the BBC. "From the time I was given command of Operation Blue Star until I planned it and executed it, let me emphatically tell you that there was no involvement whatsoever as far as the British are concerned." Paul Uppal, the UK's only Sikh MP, said many Sikhs would be "relieved that it was just purely advice that was given". He praised the speed and thoroughness of the review and said it could be an "important step" towards "some closure" for Sikhs. But Lord Indarjit Singh, director of the Network of Sikh Organisations, called Mr Hague's statement "smug and condescending". On the claim that UK advice had a "limited impact" of the Golden Temple attack, Lord Singh said: "It is like saying that I had only a minimal involvement in a massacre or a holocaust." He said the language in the documents was "insulting" to Sikhs - suggesting they were all extremists - and the UK's real motivation in assisting India was keeping its arms contracts. But Mr Hague said the review had found "no evidence" UK military advice in February 1984 had been "linked to defence sales or any other policy issue". Media captionLord Singh, Network of Sikh Organisations: "Why should Britain be involved in the attack on a religious minority"
Jasvir Singh, director of the City Sikhs Network, which represents Sikh professionals in the UK, said the information disclosed in the review "harks back" to colonial times. "I think there are lots of people in the Sikh community who are upset that the British could be involved in this, even to a limited extent," he said. Mr Singh said many details about British involvement in the 1984 attack were still unclear, and called for "transparency" from the authorities. UK Sikh groups have said the government review should have looked not only at June 1984 but also the events that followed, and Mr Singh also criticised this "narrow scope". The Indian government said the UK had kept it "informed on this matter". "We have noted the report and the statement made," an Indian foreign ministry spokesman said. David Cameron ordered the review last month after Labour MP Tom Watson said he had seen papers from Margaret Thatcher "authorising Special Air Services (SAS) to work with the Indian government". Mr Watson cited two letters released under the 30-year rule. He said a 1984 letter from the prime minister's office stated that a British adviser had "visited India and drawn up a plan" which had been approved by the Indian government. Shadow foreign secretary Douglas Alexander said "serious questions" remained about British involvement, and called for all relevant documents to be released. The Sikh separatists at the Golden Temple in 1984 had been demanding an independent homeland - called Khalistan - in Punjab.